Four years of civil war had seemed like an eternity to many Americans. The bitter hatreds that divided the North and South in 1861 had long turned to numbness and shock by 1866, as relief from the fighting and realization of the war's devastation took hold. The United States, now forever a Union, would never be the same again. Many among the largely religious populace viewed the sacrifices made-by both dead and living-as divine judgment visited on the nation from above. As Americans, victor and vanquished, started down the long and arduous road to reconciliation, God and survival were much on their minds. Monuments commemorating the national holocaust spread throughout the land. New communities in the North were named after the deadly places that took their men: The Dayton, Ohio, suburb of Shiloh and other battle names such as Shenandoah still dot the northern landscape. With Americans in their grief having turned to religion to ease the war's anguish, even the nation's coinage reflected this new priority: The now-familiar motto IN GOD WE TRUST first appeared in 1864 on the newly introduced two-cent piece. Reaction was so positive that on March 3, 1865, Congress mandated its use on all gold and silver coins of suitable size. Implementation came in 1866, when seven other coins joined the two-cent piece in making this statement of faith. Among these was the quarter dollar. 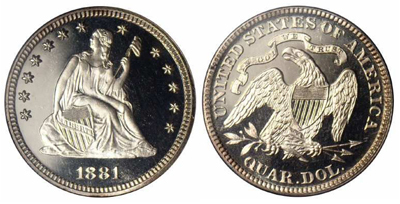 The Seated Liberty quarter was then nearing the end of its third decade of production. First issued in 1838, it replaced the Capped Bust quarter, which had lasted only 24 years. Its design, used on almost all subsequent silver coinage minted in the United States until 1892, was based on sketches by artist Thomas Sully. Assistant Engraver Christian Gobrecht executed dies featuring a seated figure of Liberty with her right hand resting upon the Union Shield and her left hand grasping a staff topped by a Liberty cap-symbols of preparedness and freedom. This seated goddess device was first used by the Greeks and Romans in antiquity and adopted in the 17th century by English coiners to represent Britannia. The reverse's central element, shared with the half dollar and dollar, depicts a naturalistic eagle with a shield superimposed upon its breast. UNITED STATES OF AMERICA is inscribed above the eagle, with QUAR. DOL. below. Chief Engraver James Barton Longacre modified the dies to accomodate the new motto IN GOD WE TRUST, and it appears on a graceful ribbon that floats above the eagle on the reverse. Mintmarks are found below the eagle ('O' for New Orleans, 'S' for San Francisco and 'CC' for Carson City). Pieces without a mintmark were coined at the primary mint in Philadelphia. Produced from 1866 through 1891, mintages were extremely low during the first few years of the design. In part, the low output resulted from the fact that while specie payments remained suspended, little bullion reached the Mint. Silver coins were still worth more than their equivalent face value in the questionable "greenbacks" the North issued to finance the war. This situation did not abate until about 1873. Mint state survivors from the years before 1874 are scarce to very rare, but the occasional gem randomly appears, often in collections completed decades ago. San Francisco and Carson City issues are particularly elusive, with the 1870-CC and 1871-CC quarters right at the top of the rarity list, eclipsed only by the nearly unique 1873-CC No Arrows coin: Although 4000 pieces of this issue were minted, obviously few escaped recoinage into the Arrows design of that year, as only four examples are traceable today. A fifth is reported but unconfirmed. In 1873, Congress made a modest attempt to introduce the metric system into U.S. coinage. As part of that effort, it increased the weights of silver coins to simplify their value in grams. To call attention to this change, arrowheads were placed alongside the date in 1873 and 1874. The Arrows coinage of these years, like the similar issues of 1853 and 54-55, is considered a separate design variety and is included in most type sets of this denomination. In 1875, the arrows were removed, although the weight remained at the new higher level. Mintages increased dramatically after 1875, due to the combination of new supplies of silver ore and passage of the Specie Act of 1875, which called for redemption in silver coin of the fractional currency notes then in widespread use. In just 1876 alone, more than 31 million quarters poured out of three of the four mints that produced this design, Philadelphia, Carson City and San Francisco. The Philadelphia issue of 1877 is the most common of its decade in gem condition, possibly due to the release of an old hoard. The New Orleans facility, closed from the beginning of the Civil War until 1879, would not resume striking quarters until 1891, minting just 68,000 examples: Survivors are rare in all grades. New Orleans struck at least two proofs in that last year of this design, marking the resumption of quarter coinage at the southern branch. Production levels plunged again in 1879, as vast quantities of silver dollars required by the Bland-Allison Act taxed the Mint's production capacity. Mintages stayed minuscule from then through the end of the series, with only three exceptions-the San Francisco coinage of 1888 and 1891 and the Philadelphia issue of that final year. Otherwise, yearly output never reached 100,000 at any given mint during the period. For the most part, it was well below 20,000, hitting a nadir of just 5,000 (plus 886 proofs) in 1886. Much of the Philadelphia mintage of 1879 through 1890 was hoarded when issued, providing collectors of today with superb examples of these low-mintage coins. Uncirculated sets of Seated quarters from these years were common sights at coin shows just a few decades ago and are still assembled today, albeit at loftier prices. High-grade pieces are avidly pursued by type collectors. Proofs were minted every year from 1866 through 1891. While business-strike examples frequently had limited productions, the mintage figures for proofs were normal for the era, ranging from a low of 510 in 1877 to a high of 1,355 in 1880. Because they were preserved more carefully, proofs have a higher survival rate than business strikes. The availability of both drops off sharply in grades of Proof-66, Mint State-66 and above. Points to first show wear are Liberty's knees, breast and hair. On the reverse, check the eagle's neck, claws and the tops of its wings. In 1892, after a run of over fifty years, the Seated Liberty coinage was finally retired. The motto that appeared since 1866 continued on Charles Barber's new design, this time placed on the obverse, over Liberty's head. BIBLIOGRAPHY: Bowers, Q. David, United States Dimes, Quarters and Half Dollars, Bowers and Merena Galleries, Wolfeboro, NH, 1986. Breen, Walter, Walter Breen's Complete Encyclopedia of U.S. and Colonial Coins, F.C.I. Press/Doubleday, New York, 1988. Briggs, Larry, The Comprehensive Encyclopedia of United States Liberty Seated Quarters, Larry Briggs Rare Coins, Lima, OH, 1991. Taxay, Don, The U.S. Mint and Coinage, Arco Publishing Co., New York, 1966. Yeoman, R.S., A Guide Book of United States Coins, 47th Edition, Western Publishing Co., Racine, WI, 1993.